Guwahati: Tata Motors, first company in India to get ARAI and homologation certification for their 9m for their 9m and 12m electric buses, today commenced trials of its 9 meters electric bus in Guwahati. With a seating capacity of 26-34 passengers, the full-auto transmission Tata Ultra ELECTRIC 9m bus was flagged off by Shri. Anand Prakash Tiwari, Managing Director, Assam State Transport Corporation (ASTC). ASTC in collaboration with Tata Motors will do this trial for seven days and will offer free transport service to the participants of FIFA team and devotees from Plantan Bazar to Maa Kamakhya Temple. This trial is in continuation to the successful trial of the 9 meters electric bus from Parwanoo to Shimla a few months ago, where the bus performed exceedingly well covering a distance of 160 kms in one full charge. The trials in Chandigarh also showed very encouraging results in a running of 143 kms, covering approximately 70% of the charge. These trials are a part of the Ministry of Road Transport’s agenda for the electrification of public transport, for which Tata Motors is getting ready with its range of electric vehicles, from 9 meters and 12 meters with various seating configurations, as well as its last mile passenger transport vehicle, the Tata Magic Iris. Tata Motors has been at the forefront of hybridization and electrification of passenger transportation and has developed technologies of Hybrid and Electric vehicles. With regard to alternative fuel technology, Tata Motors offers a range of vehicles, starting from CNG, LNG, Bio CNG, Bio Diesel to Fuel Cell. The Electric vehicle developed on proven bus platforms provides excellent driveability and restart gradeability along with regenerative braking which recovers between 25 to 35% of the brake energy. 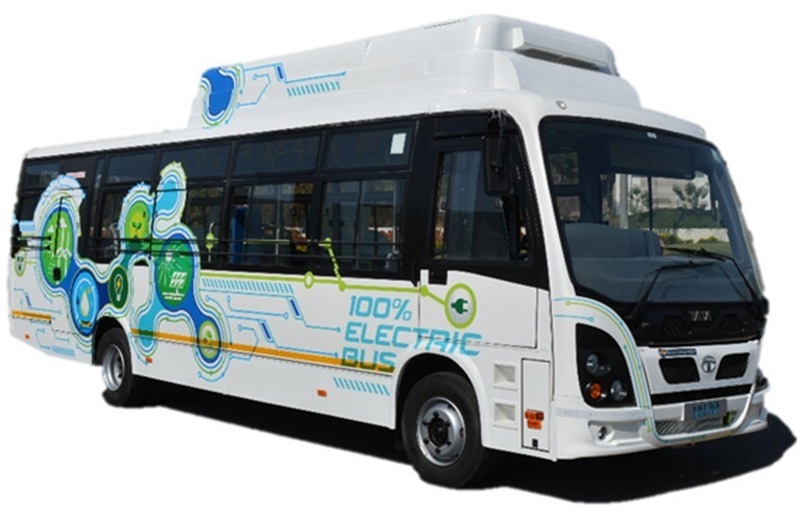 The electric buses are equipped with a highly efficient drive train and weight optimized battery, coupled with Tata Motors proprietary energy management system and vehicle control strategy for a low Total Cost of Ownership. EV battery pack is optimized for providing no compromise on the passenger capacity proving the best efficiency in Kwhr/km. The EV battery is liquid cooled and specially designed for Indian temperature condition thus providing a higher battery life along with highly efficient performance. The roof mounted battery provides safety from water logging of electrical equipment. The range of the buses can be enhanced with smaller battery pack to 200 to 240 km with opportunity charging. The Electric Bus is also loaded with all modern features such as Multiplex wiring system, automatic ticketing / Smart Card enabled system, ITS enabled and Reverse camera assist etc. which can be fitted on customer request. As a leading player in the commercial vehicle segment Tata Motors, reiterates its commitment towards smart and green technologies and mobility solutions through its e-mobility plans for India. The company has launched the 9 meter and 12 meter STARBUS ELECTRIC bus, along with a range of last mile passenger small commercial vehicle like IRIS and Magic, the 18m articulated bus for Mass Rapid Transportation, all designed, developed, to meet the current and future passenger transportation needs of Smart Cities. To remain in forefront of technology Tata Motors has also previously showcased a futuristic 12m HYDROGEN FUEL-CELL full low floor bus.